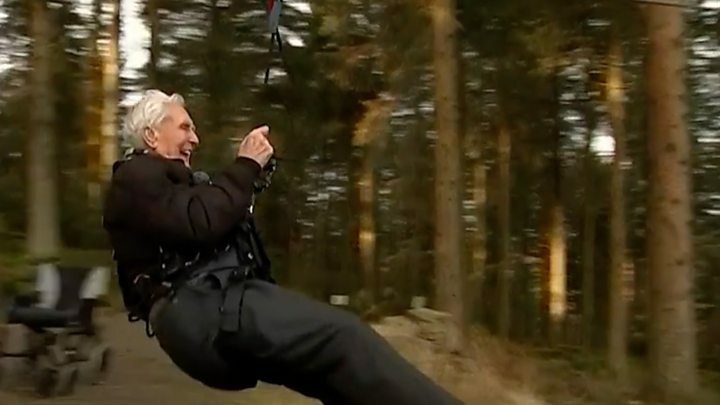 A man has collected his third Guinness World Record on his 106th birthday by becoming the oldest person to ride a zip wire.Jack Reynolds, from Hollingwood, near Chesterfield, scaled the 197ft-high (60m) wire on live TV to raise money for a stroke charity.Mr Reynolds became the oldest person to ride a rollercoaster in April 2017.On his 104th birthday he became the oldest person to get their first tattoo. Mr Reynolds said he had had the "perfect day"
The daredevil travelled down the 1,312ft-long (400m) zip wire live on ITV. He said to the camera: "This speaks for itself. "When asked how the zip wire ride compared to his previous adventures, he replied: "It's different but it's better. It's been a really good day today. "It's been perfect." When he turned 102 he took part in the ice bucket challenge, raising money for research into motor neurone disease, wearing just a pair of Union Jack flag underpants.Mr Reynolds has previously said a drop of whisky added to his morning tea helped him stay fit and healthy. On his JustGiving page, he said: "It has become somewhat of a tradition that on my birthday I use my new age to help raise money for worthy charities. "Please follow my journey and help me achieve my target for this great cause."